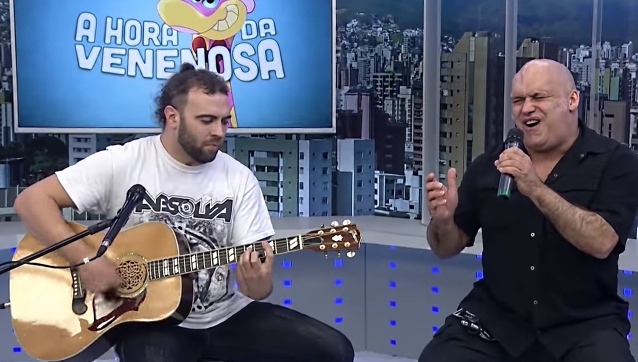 British heavy metal vocalist Blaze Bayley (IRON MAIDEN, WOLFSBANE) recently performed acoustic versions of IRON MAIDEN's "Futureal" and his solo song "A Thousand Years" live on the Brazilian TV show "A Hora da Venenosa". Check out video footage below. Bayley will release the "Live In France" live album and DVD on March 1. The set will contain a recording of Blaze's May 25, 2018 and May 26, 2018 concerts at Chez Paulette, near Nancy, France. The 55-year-old Bayley, who was born in Birmingham, was the original frontman in WOLFSBANE, but left in 1994 to join IRON MAIDEN. He recorded two studio albums with the Steve Harris-led group — 1995's "The X Factor" and 1998's "Virtual XI" — before Bruce Dickinson returned to the band.